Dr. Ken Dawson-Scully is an Associate Professor in the Department of Biological Sciences at Florida Atlantic University. He received his Master’s degree in Neurobiology from Queen’s University and his PhD in Neurophysiology from the University of Toronto. Ken then conducted postdoctoral research at the University of Toronto before joining the faculty at Florida Atlantic University. Ken is here with us today to tell us all about his journey through life and science. Much of Ken’s free time is spent with his two kids. His daughter plays basketball and the trombone, and his son is into tennis and the baritone. This means he gets to go to a lot of practices, games, and concerts with his family. Moving from Canada to Florida has turned them into avid beach-goers as well, so they like to enjoy as much sand and sun together as possible. Ken uses the fruit fly as a model to understand how animals have adapted to different kinds of changes in the environment and how they can cope with it. He uses neurophysiology and behavioral genetics approaches to study the impacts of different kinds of stresses, including high temperature and low oxygen. This work has important applications for human conditions like febrile seizures that can occur when the body temperature rises or complications from stroke that deprive parts of the brain of oxygen. In high school, Ken had a fantastic teacher who taught him physics. He really liked the subject and how the teacher presented the material. Initially in undergrad, Ken didn’t even initially know that neuroscience existed, but he got connected with another phenomenal teacher who introduced him to the subject and also got him involved in working in a lab doing independent research. In his graduate research, Ken made a finding that was opposite from what was published in the literature (by some highly respected scientists). He did the experiments over and over again because everyone thought he had done something wrong, but even after many repetitions and approaching the question from different angles, the opposite results persisted. Publishing these results led to a lot of uncomfortable moments at conferences and even at his own university. As a postdoc, Ken combined his previous experience from undergraduate with a particular genetically controlled molecular mechanism with recent publications from another research group on another gene related to feeding behavior to develop an interesting integrative hypothesis. He tested this hypothesis, and the results turned out exactly as expected. This was one of those rare, picture-perfect examples of the scientific process leading to discovery! Ken’s campus at Florida Atlantic University is the site for the first North American Max Planck Institute. Ken was able to go to Germany to visit the Max Planck Institutes there to learn about how to further collaborations with their nearby Institute. There, he met so many fantastic neuroscientists, including a few Nobel Laureates. Visiting the labs of these brilliant scientists was amazing, and this was one of the most memorable trips of his life. The lab where Ken did his PhD had tea time every Wednesday at 3pm. They alternated who would bring dessert and would meet around a lab bench to enjoy tea and cake. Once, instead of a small cake, Ken brought an enormous gingerbread house. This was partially eaten during tea time, and then remained in the lab on top of a fridge for eight years before it finally disappeared. To do science you have to have the passion, but you also have to have tenacity and tolerance for the mundane. Dr. Dawson-Scully was born and educated in Canada where he received his Ph.D. from the University of Toronto in 2003 and his M.Sc. from Queen’s University in 1998. 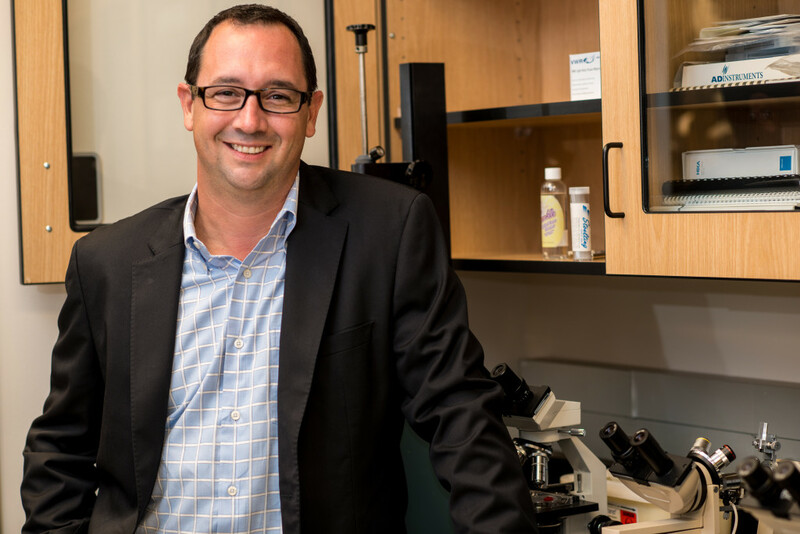 He is currently an Associate Professor in the Department of Biological Sciences at Florida Atlantic University, a Visiting Investigator at The Scripps Research Institute in Florida, and a faculty member of the newly formed International Max Planck Research School (IMPRS). His laboratory investigates ways to protect the brain from neurodegeneration as a result of acute and/or chronic cellular stress using the genetic model organism, the fruit fly D. melanogaster. His research has identified a number of molecular targets that can rescue high temperature, low oxygen, and oxidative stress in the fruit fly nervous system, as a model for human diseases such as stroke and epilepsy. Dr. Dawson-Scully’s research program has translated his findings from fly, to zebrafish, fresh water turtle, and mouse successfully, which has led to the submissions of three novel US patents for the medical treatment of febrile seizure, migraine, and stroke in humans (two of which were recently granted). His research program is poised to move discovered pharmaceutical therapeutics from the bench-side to the bed-side through the commercialization of the technologies he has uncovered in his research, solidifying commercial interests. Most recently, he was granted $353,000 in funding from Eco Neurologics Inc., a recent FAU start-up that has licensed his intellectual property. Dr. Dawson-Scully is currently the senior scientific consultant of Eco Neurologics Inc.